In order to celebrate the changing of seasons, I'm doing a two-part series that features two essential flavors of fall: apple and pumpkin! For each series, I will post three blog entries- three great ways to use each ingredient. (1) Apple Pie - always a classic! (2) French Toast topped with Caramelized Apple, Cardamom Whipped Cream, and Candied Walnuts. YUM! (3) Applesauce Spice Cupcakes, topped with a Caramelized Apple Swiss Meringue Buttercream. The chunks of apple in this butter cream = pure joy to your taste buds! 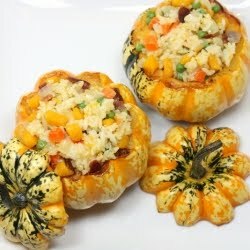 Make sure to check out all the great recipes in the Pumpkin Series! Everything looks so yummy! I really want to try those cupcakes! !